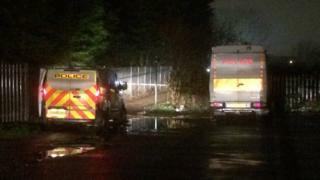 Police are investigating the "suspicious" death of a teenage girl whose body was discovered in South Yorkshire. The girl, who has not been formally named, was found on a pathway near Lordens Hill, Dinnington, Rotherham, shortly before 11:00 GMT. Police are treating the death as suspicious because of "concerns about the state of the body and injuries". Supt Sarah Poolman said inquiries were under way and appealed for witnesses. She said: "We are imploring anybody and urging anyone who knows anything about this event and anyone who saw any suspicious behaviour in the area to please come forward. Image caption Supt Sarah Poolman said the girl's death is being treated as "suspicious"
Kevin Barron, the Labour MP for Rother Valley, said: "I am incredibly sad to hear about the discovery of a teenage girl's body in Dinnington this morning. "I would like to send my condolences to the family and friends of this young girl."